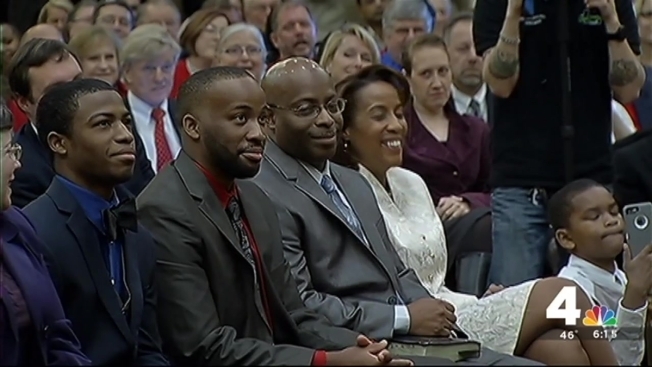 History was made in Loudoun County on Saturday, when two African Americans were sworn into the county's board of supervisors for the first time in Loudoun's 250-year history. Phyllis Randall was elected board chair in November, and Koran Saines was elected to represent the Sterling district. Both took the oath of office Saturday at Landsdowne Resort. "Today is a day of bipartisan celebration as the new board takes office," Randall said in advance of the ceremony. "We're really excited about all that we have to do." Saturday also marked another major change for the county. Previously, board members were sworn in during separate ceremonies for Democrats and Republicans, a practice Randall said needed to end. "And you know, local issues are never partisan issues, and so it's important to start this administration, start these next four years in a bipartisan way, and we're going to do that today," Randall said. "We're one county, we're one board, and you get sworn in at the same time," she said. A reception and gala will be held Saturday evening. Tickets are available to the general public online here.